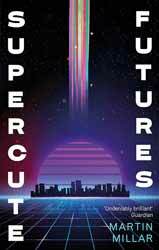 Supercute Futures (2018. 228 pages) is a cyberpunk novel, written by Martin Miller. The book is a light and fluffy affair, possibly deliberately to reflect the heavy kawaii elements in the story. Both Mox and Mitsu, as well as their millions of fans, are obsessed with the mawkishly gaudy products which they sell, and, in some ways, this is a bit of a front for the girls, as the story does have some darker undertones which are unfortunately not really brought to the forefront of the story. Their fluffy personas also hide the fact that they have been enhanced so many times that apart for some brain tissue they are ninety-five percent artificial. Externally they still look like fun loving twenty-year-old’s, but many decades have passed with no change in their appearance. This does cause a bit of a problem in one of the novel's plot points. Part of their plan is to clone themselves. On the surface this sounds fine, but the clones look identical to Mox and Mitsu. So, if they are likewise mostly artificial, then that’s not a clone, but if they have been cloned from the remaining five percent of their brain, they would be noticeably more human and distinctly unenhanced. The book spends an inordinate amount of time on the kawaii elements and the plot doesn’t really kick in until around page sixty, which is a large proportion of the novel’s length. The story further dips out for sections where the two engage in therapy with an AI. These are used to build up the two's backstory but take away more space from the plot. Ultimately with these restrictions, the actual plot takes up very little of the overall book. Given its cute angle for a dystopian novel, there is much to enjoy here, mostly though you have to buy into the kawaii elements, if not I could see that the heavy layers of cuteness may turn some people off.